I am so happy to be a part of helping you create new headshots for you or your business. Your images are often a potential clients first view or you and your business which makes them extremely important. I am here to make sure we capture just the right look for you and your business! Make SURE all of your clothes are pressed and not wrinkled. Wrinkles will show and will not look good. If you have several options, please bring them on hangers with accessories. Collect any branded props that will be needed for your images. Feel free to start a Pinterest board for your personal branding photos with images that give the feel and style of your business. This is not as important with the basic headshot session but definitely helpful if you are doing the Image Builder session where you will be doing a more in depth session for your web presence. I would love if you could share the board with me at least a week before your session. We will meet at the scheduled location at the scheduled time. We will take a few minutes to chat and take a look through your clothing options and make a plan. I will also answer any questions you may have. Now you can relax...you DID it! The hard part is over. I will get started on editing and creating your private online gallery. About a week after your session, I will create your gallery and send you an email with a link and password. Your gallery will be up and active for 2 months. Your digital file order will be due within that time. Check out these suggestions for getting your outfits prepared for your photo session. Good question and I don't have a perfect answer... there are a lot of variables that will be a factor such as changing outfits, setting up shots & shooting. I don't work sessions by time, but by capturing the images we need. But here is an idea of what you should allow in your schedule for time. HOW WILL I RECEIVE MY DIGITAL FILES? A couple days after you place your digital order, I will edit your images and send them via "Hightail". You will receive a download link for your files. Your files will be large full resolution files and ready for your needs. Please let me know if you will be needing b&w images as I can convert those for you at no charge. HOW ABOUT FILES FOR SOCIAL MEDIA AND WEB USE? The files that you receive are large files and not ready for most web usage. They will have to be resized down to fit each platform. I do not resize them as there are so many different sizes and needs. If you need a couple resized...I am happy to do that for you. CAN WE PURCHASE PRINTS AS WELL? Yes, of course! There will be a product catalog included with your email when your galley is ready to view. Feel free to order any prints or products if you wish. Yes! I LOVE that you share your images!! Feel free to share images once you receive your digital files. I always appreciate a kind tag. 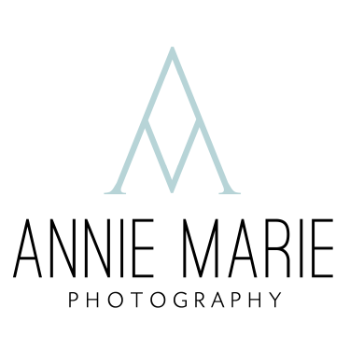 On Instagram @annie.marie.photography and on Facebook at annie marie photography.